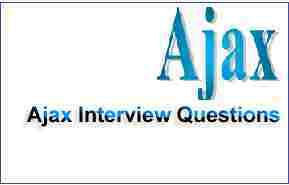 The XMLHttpRequest object is part of a technology called AJAX. AJAX is very faster and easy, we can implement AJAX in a meaningful manner. The AJAX was popular in 2005 by Google, with Google Suggest. Syntax- The parameters specify one or more name/value pairs for the AJAX request. Why do you use Ajax? Is Ajax still in use? Is Ajax considered a programming language? The AJAXis a client-side script that communicates to and from a server/database without the need for a post-back or a complete page refresh. Which are the two methods used for cross domain AJAX calls? What are the technologies used by AJAX? What is JSON in AJAX? How to handle multiple Async Ajax Requests? We well know $.Ajax () is call asynchronously by nature but problem is that multiple (>1000 calls) Async AJAX calls on a single page. But its display error: err_insufficient_resources when using chrome any hints. //All AJAX requests are finished. 2) An asynchronous call by XMLHttpRequest and it is hold and wait process. 3) Reduce the traffic travels between the client and the server and the response time is faster so increases performance and speed. 4) Better responsive and interactivity and faster page renders and improved response times. 5) Supports almost all modern browsers. 1. Insecure and increment the load on web server. 2. All files are downloaded at client-side. 3. Browser compatibility issues accrued. 4. The search engines are not crawling AJAX generated content that means Google can’t index AJAX pages. 5. AJAX does not play well in encrypted environments. 6. The server information can't be accessed using AJAX. 7. Data of all requests is URL encoded and causes increases the size of the request. 8. ActiveX requests are enabled only in Internet Explorer and newer latest browser. How does an AJAX call work?